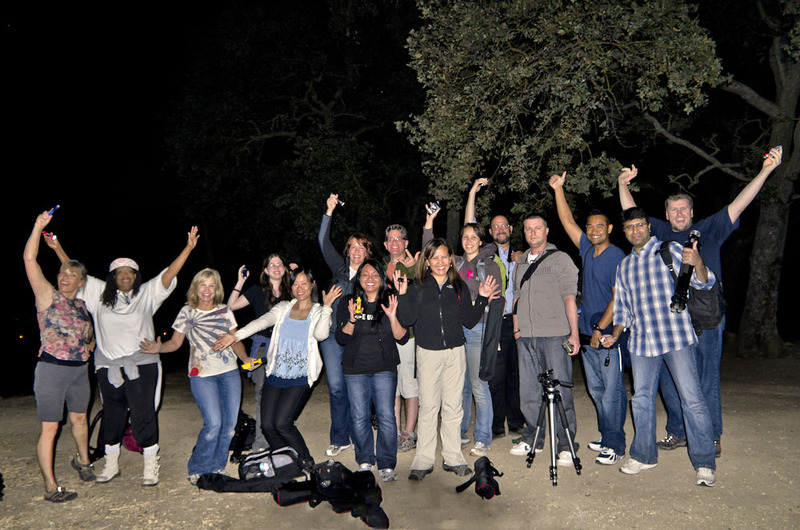 Once the sun goes down the world of night photography opens up and on this warm summer night our photography workshop group experienced some great conditions for shooting stars, star trails and light painting! At 7:30pm we started orientation at the Aperture Academy Gallery, a 4,000 square foot facility that acts as both a fine art photography gallery as well as classroom and venue. We spent the first 30 minutes getting to know one another, talking about gear and walking through the plan for the evenings shoot. We talked about gear and how to use it, covered the settings we'd be experimenting with for best results and a quick safety chat. With the sunset only about 15 minutes away it was time to load up and head south out of San Jose and toward Almaden Valley where the night sky is darker and more stars will be visible. As we got our tripods stable, cameras setup we worked on composition and how to lock focus so that once it was dark we would be sure to get sharp images during our long exposures. It was showtime! We started with light painting exercises...this is a lot of fun and really teaches you how your camera reacts to light. This also helped pass the time as we waited for the darkness to settle in so that we could begin to work on start trails and pinpoint stars...and that we did! Finally, the sun was far beyond the horizon and shifted our cameras into Bulb mode and began a series of long exposures...first 5 minutes, then 10 minutes, and so on. We work carefully to adjust white balance so that we captured the warmth of the old oak tree but still pulled the blueness of the dark sky into our pictures. Then to wrap things up, Jean brought out some fun colored lights and we performed a series of 30 second exposures to capture the motion of the swirling lights as well as wrote a couple of words (backwards of course!) for some last minute fun before returning to the Aperture Academy to say our good-byes. Jean, Stephen and the rest of the team at Aperture Academy!